The cast of Star Trek greets the Space Shuttle Enterprise as it rolls out of the hangar. In this historical photo from the U.S. space agency, The Shuttle Enterprise rolls out of the Palmdale manufacturing facilities on Sept. 17, 1976, with Star Trek television cast members standing by. 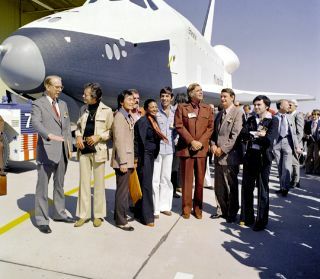 From left to right they are: Dr. James D. Fletcher, NASA Administrator, DeForest Kelley (Dr. "Bones" McCoy), George Takei (Mr. Sulu), James Doohan (Mr. Scott), Nichelle Nichols (Lt. Uhura), Leonard Nimoy (the indefatigable Mr. Spock), Gene Rodenberry (The Great Bird of the Galaxy), and Walter Koenig (Ensign Pavel Chekov).